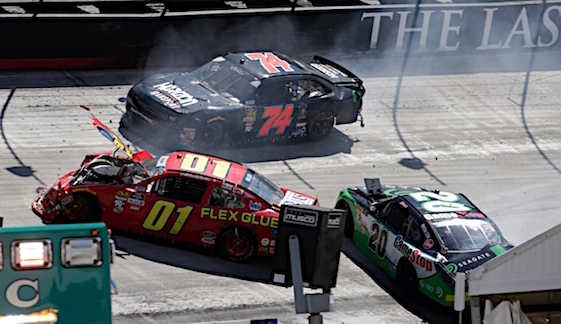 “The bumpers, the way they line up now, it’s almost impossible for us to spin somebody around,” Newman said Friday at Bristol Motor Speedway during preparations for Sunday’s Food City 500. “It’s like you have to drive through them and then knock a hole in your nose. Before you could just lift a guy’s tires up off the ground and kind of shake him out of the way. If he saved it, he saved it. If we didn’t, well, we’d talk about it afterwards. In seven races this season, Ryan Blaney has produced three top-five finishes and one pole, but the Team Penske driver is frustrated. “I’m tired of being in spots with a chance to win and just dumb luck happens and it just gets taken all away from you,” Blaney said Friday. Last weekend at Texas Motor Speedway, Blaney was leading the race when a part fell off and his Ford Mustang’s engine blew. “I’m really only frustrated for 10 minutes after the deal happens,” Blaney explained. “Then you focus on the next week because there’s nothing you can do about it after something like that happens. You just try to make sure it doesn’t happen again. Chase Briscoe is one of four NASCAR Xfinity drivers competing in Saturday’s Alsco 300 with an opportunity to win $100,000 in the series Dash 4 Cash. That’s quite a change from the time when Briscoe wasn’t getting paid to do anything. “My mom and dad were giving me a little bit of money, but never had the kind of money to support me full time,” Briscoe said Friday. “I’d pay rent. It was $50 every month or two when I could afford it. So what would Briscoe do with $100,000?